If there were ever a data compression method to take the world by storm, it would be Huffman encoding. In fact, this was the method that got me into computational methods to begin with. I distinctly remember sitting in my data compression class and talking about the great information theorist Claude Shannon and Robert Fano, when suddenly my professor introduced a new kid to the mix: David Huffman. He managed to rip the heart out of the methods described by leaders of the field and create a data compression method that was easier to understand and implement, while also providing more robust results, and apparently this was all done for a school project! It was in that moment, I knew I would never amount to anything. I have since accepted that fact and moved on. Huffman encoding follows from the problem described in the Data Compression section. We have a string that we want to encode into bits. Huffman encoding ensures that our encoded bitstring is as small as possible without losing any information. Because it is both lossless and guarantees the smallest possible bit length, it outright replaces both Shannon and Shannon-Fano encoding in most cases, which is a little weird because the method was devised while Huffman was taking a course from Fano, himself! The idea is somewhat straightforward in principle, but a little difficult to code in practice. By creating a binary tree of the input alphabet, every branch can be provided a unique bit representation simply by assigning a binary value to each child and reading to a character in a leaf node if starting from the root node. Order all characters according to the frequency they appear in the input bitstring, with the most frequent character at the top of the list. Be sure to keep track of the frequencies, too! Add the smallest two values together to create a new node with a new frequency. Keep doing step 2 until the tree is complete. Encode your phrase with the codebook. and bibbity_bobbity becomes 01000010010111011110111000100101110. As mentioned this uses the minimum number of bits possible for encoding. The fact that this algorithm is both conceptually simple and provably useful is rather extraordinary to me and is why Huffman encoding will always hold a special place in my heart. In code, this can be a little tricky. It requires a method to continually sort the nodes as you add more and more nodes to the system. The most straightforward way to do this in some languages is with a priority queue, but depending on the language, this might be more or less appropriate. In addition, to read the tree backwards, some sort of Depth First Search needs to be implemented. Whether you use a stack or straight-up recursion also depends on the language, but the recursive method is a little easier to understand in most cases. # to create bitstrings for each character. 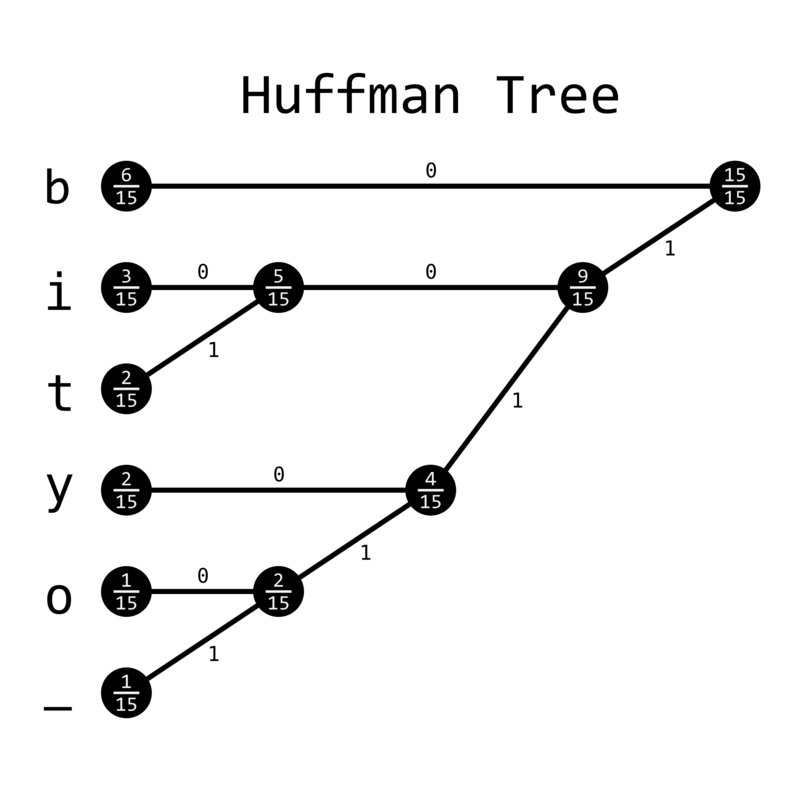 let msg = "bibbity bobbity"
// The Node class used for the Huffman Tree. // Creates a leaf. So just a node is created with the given values. // Creates a branch. Here a node is created by adding the keys and weights of both childs together. // Node with biggest value at the top. // Go down the tree. // Create a List of all characters and their count in input by putting them into nodes. // Convert list of nodes to a NodePriorityList. // We&apos;re using a string instead of a actual bits here, since it makes the code somewhat more readable and this is an educational example. // We&apos;re using a string right here. While no compression is achieved with a string, it&apos;s the easiest way to display what the compressed result looks like. Also this is just an educational example. // The bitStrings are just strings and provide no compression. Look in HuffmanCoding.cs for explanation. // value at any time. std::cout << "\n\nAs opposed to the original, which is "
<< to_be_encoded.size() * 8 << " bits, the encoded has size "
"remove the frequencies in the huffmantree tree"
"take a string s and return a coded string"
"takes a string s and a hash-map hash-decoder and decode s"
original:   .string "Original message: %s\n"
encoded:    .string "Encoded message: "
decoded:    .string "Decoded message: %s\n"
mov    WORD PTR [rsp + 1], 0x203a           # Then ": "
The image "huffman_tree" was created by Julian Schacher and is licenced under the Creative Commons Attribution-ShareAlike 4.0 International License.